This “conversation” took place over the time it took to type it but developed over a lifetime. The interviewer could be described as the alter ego of the interviewee. The exercise is narcissistic and allows for the fact that Williams is and has always been fortunate to have attention deficit disorder, aka A.D.D. This syndrome, before it was a syndrome, was known variously as dilettantism, being scatterbrained, absent minded, dreamy, erratic, all over the place and by a lot of other euphemisms. Today, it’s another way for certain professionals and druggists to make a payment on the boat but for those who are graced by it, it can be an inspiration, a joy and a generously fulfilling experience of what life has to offer. The interview form allows one to jump around as one “afflicted” with being scatterbrained might in conversation, changing the subject but in a way that moves the story along. This is a monologue about personal experience with friends who when they conversed and interacted around common interests, called themselves ONYX. The interview form presents the monologue in a way we hope is friendy and digestible. This “conversation” took place in front of a glowing screen beginning during the Winter of 2012-13 and continues . . . When did you come to New York? How did you start out? We, my wife Elsa and I, moved to New York on graduating from architecture school at the University of Utah and an experience in the Peace Corps in the mid sixties. Elsa, from California, graduated from Stanford and came to Utah to get her Masters in architecture. I'd grown up on Long Island and lived out West for about eight years. 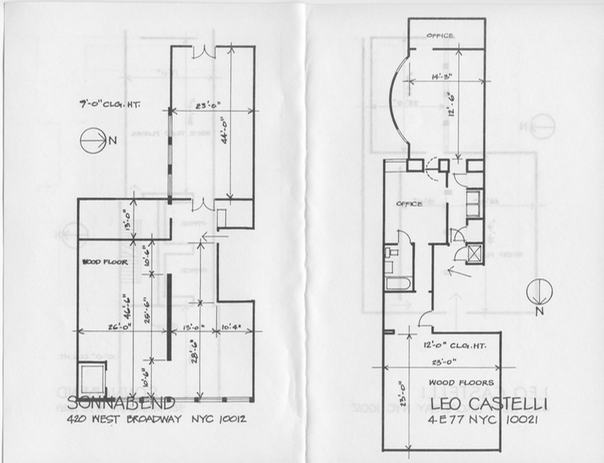 Our first New York apartment was eight floors above the corner of 36th Street and Park Avenue. We were right in the middle of everything, we could even watch the helicopters land on the PanAm building: it was the Future! We found jobs and walked to work. Our acquaintances were other graduates from Utah, the people we met at work and friends who were also starting careers in the city. Becoming New Yorkers was the main thing that occupied us. Pay rent and live in an apartment in the city and you're as much a New Yorker as you will ever be. When Woody Rainey moved to the city a while after us, he found a place near ours (we’d moved further uptown). We began a conversation that grew as we met others looking for a way into architecture/art/design that wasn't just a job. We went to gallery openings and made paintings and drawings that continued habits we'd acquired in school. At school we responded to the assignments from our professors but in New York we directed ourselves. We were inspired by gallery shows, exhibits and occasional trips to architectural sites, like Wright's Falling Water, Louis Kahn's work at Bryn Mawr and the Prickly Mountain houses in Vermont. If it was reachable, we'd check it out. It sounds like the city was your new playground. We were all over the city, walking, biking, running; we explored it every way we could. One of our friends, Sheridan Bell, ran behind city busses. He found that there was a pocket of fresh air coming over the top of the bus that he could run in. The busses were very steady in their speed, acceleration and braking so he found it very comfortable to run behind them. When they stopped he'd move up (transfer?) to the bus ahead and continue his journey. He thought nothing of covering miles behind big stinky city busses. We rode our bikes all over the city on weekends, like trips down Broadway from Columbia to the harbor. We'd ride around late at night, a few times up along the old closed West Side Highway in the dark and fog. On one of those rides I came to understand photography's Zone system. We avoided the areas that might have traffic so we could look and see without distraction. A few times we rode down Broadway for miles on holiday weekends when the city was empty. Those rides gave us a very clear idea of the geography of the city and its relationship to New Jersey and Long Island, the Hudson and the East River. Elsa and I took trip to England and met some designers, looked at old buildings and new like James Stirling's earlier work; that all added material to our conversations when we returned. We drove across the country quite a few times and some of Canada, camping and looking. I’d hitched or driven back and forth across the country for some years and that sort of travel was newer for Elsa. No matter how many trips, there was always something new to see or experience. The city itself, particularly SOHO had its effect on us as the development of artist’s lofts and shops provided a place to see art and to work. The hoarding around construction sites provided display walls for street art and the art in the galleries provided motivation. SOHO was being invaded by artists who needed studio spaces; lofts in the area were being converted to living/studio spaces. Galleries opened in street level spaces and showed the work being done in the neighborhood. How did you reconcile your different views? Our interests varied a lot but we were open to other's views and we saw the various approaches to what we were thinking more exciting than fitting into what was the current wider art/architecture conversation about modernism vs. post-modernism. We were also less interested in pushing our own ideas on our friends than in being surprised by what they came up with themselves. The result was entertaining and motivating and allowed us a more independent existence than it might in a world of argument and verbal jousting. Somehow we avoiding fighting; we just got along. Architecture school at Utah was different; that, we only realized later. Our Dean, Roger Bailey, was into cooperation instead of competition. His influence was much stronger than what we thought at the time. Competition seems to close down alternatives and narrow focus whereas what happened in that environment put competition second; it was there but the lack of overt animosity that competition can engender created an atmosphere of real diversity. There were students exploring all sorts of possibilities, reinforcing and enriching each other rather than tearing each other down. The design juries were rough which made up for the missing tension that might have existed in a more competitive environment. Woody and I were the ONYX people from Utah; we encouraged an atmosphere of reinforcement rather than competition. The atmosphere among artists, painters, sculptors, critics in the city at that time just didn’t apply to us. We used our ambition to make what we were already doing better and helped each other to do that. We were never even really conscious of our attitudes. Utah had another influence on our way of thinking. Our attention tended to be more toward architecture as it related to a cosmic consciousness. The mountains of Northern Utah, the canyons of Southern Utah and the awareness that landscape brings to one's sense of time shaped our conversations. Meeting Mike Hinge and his sci-fi crowd added another color as well. Our attitude toward history wasn't limited to what might be called architectural history but more toward the history of the Earth as part of the cosmos. Everyday as we left the Utah campus we were treated to a sunset over a hundred mile view. In New York that became the views up and down the Avenues and across the rivers. Why the broadsheets, the posters? What was behind the name "ONYX”? We thought we could have more fun with our ideas if we had a way to spread word of them, get more people involved. We began composing broadsheets that instead of directly describing our ideas, reflected and refracted them, intentionally mystifying to encourage questions about what we were doing. We lacked a sophisticated knowledge of public relations, promotion and any affection for academic discussion. We were reluctant to get into a position that interfered with concentrating on what we were doing and we weren't too concerned about it. Our work was included in surveys of speculative architecture but to our delight, never questioned. The architectural community didn't seem to know what to make of us. 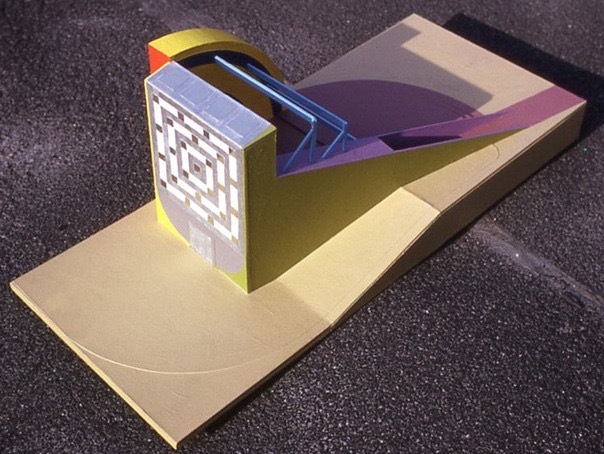 Our first "projects" were based on more abstract questions than what architectural school exercises demanded. We stretched our ideas as far as our imaginations would allow. The ideas began to gain depth and working with them became richer as we thought about the projects, ways of building them and their possible details. We discussed and began conceiving of ways to tell others about our ideas and realized that we might as well have a name that might not say anything to others but had some meaning in terms of who we were as a group. It's difficult to remember just where it came from but the word "onyx" felt right and comfortable. We looked it this way: Onyx is a multilayered stone and we saw ourselves as multilayered and variably colored in our enthusiasms. We aimed for a stone like persistence. Onyx, the stone, can be quite beautiful and we hoped to create work that embodied that beauty. We saw the O as "Oh! ", the NY as where we were and the X as the unknown: what next? In that sense ONYX could be acronymical. However, I can’t say that it meant the same to all of us. What inspired the character of the broadsheets? As posters, the graphics were not exactly what one would expect of a group of recent architecture school graduates. Some of the inspirations for our broadsheets came from San Francisco rock concert posters, posters by the Japanese artist Tadanori Yokoo and Tibetan tankas. The thing they had in common was that they asked a viewer to look more than twice to get the message. Head comics had their affect on us too. We looked toward saying as much as possible without exposing our ideas to what seemed to us at the time to be a lot of prattle. We were interested in ideas that exposed us personally to unusual ways of dealing with built space. We were more interested in questions than answers. They were kind of mysterious. There was never any clear explanation of things like the "DEC"or "MBH". What was that all about? One of the first projects was for the DEC or Daily Earth Chronicle. My brother, taking advantage of a depressed market in residential real estate scraped up enough credit to buy an empty SRO brownstone to convert to his own house. Exploring his new building's roof and the roof top of our apartment building and adjacent similar buildings I saw that the precipitous edges of the roofs extended for hundreds of feet over the street or backyards. What it would be like if those two edges were not twenty, twenty-five yards apart but only a few feet? The DEC was this arrangement of parapet walls without the intervening apartments. To be able to walk the length of a block of ten New York tenement buildings, at about the same height above the ground on top of a wall no more than four feet thick - what would that be like? If you could run along that line, would it feel like flying? How to build it? What would it look like? Where could, would, should it be built? How would it be sited? We explored the idea with drawings, paintings and models. Someone pointed us to photos of the astronomy instruments at Jantar Mantar in New Delhi and we realized that the wall would act like a sun dial as the day passed and its shadow moved across the ground, hence the DEC. The passing of the shadow over the semicircular court resonated with the sun dial idea. The Jantar Mantar structures opened up richer possibilities as we thought about the effect of the sun on the wall at different times of the day and year and how it would affect its orientation, openings and details. The next step was to create a shelter that allowed you to experience the wall as an astronomical piece over a period of space/time. The recessed shelter with its semicircular court created an artificial horizon that isolated the experience of the wall limiting it to the sun, sky, and stars. What about the MBH? Where did that come from, what was it supposed to be? Expressing a minimal extreme space with the DEC led to the question of living in a minimal space. The project that arose from this question was the MBH (Most Beautiful House). Its name arose from the notion that it could use a name and then whim took over. But the question prompted more questions: what was the minimum space in one dimension in which one could live while still having one's feet on the ground, i.e., not in a space ship? The arbitrary dimension we arrived at was six feet; now we have a measure, how can it work? It was a liberating design exercise. We were considering what happened when space this narrow constricted the everyday requirements of living. We had to look at the most basic arrangement of a plan in new ways. We realized that if your living or private spaces are minimalized, there has to be a compensating alternative that allows you to experience a larger space when claustrophobia takes over, which it will for most people whose private space is tiny. The street is not enough - there has to be the kind of space a club, library or dining place provides. Who knows what the future holds in this regard? The recent studies of minimal living space and small "hotel" rooms are the beginning of that urban future. An experience during that time complimented our thinking on minimal spaces: work on the remodeling of an old YMCA building which had a combination of small hostel spaces with communal spaces like a gymnasium, library and dining halls. The MBH used the six foot spaces to surround a larger space, an indoor/outdoor room; it would provide relief from the restrictions of the minimal living space. 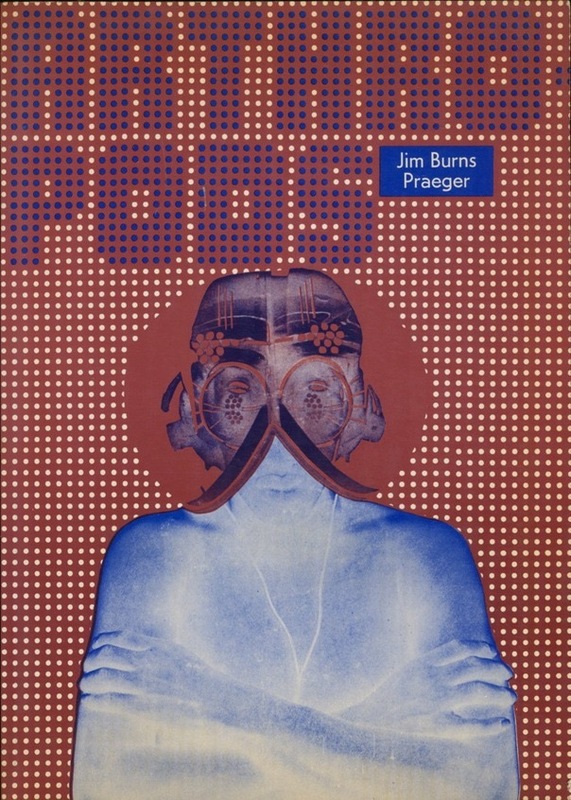 There were references to your work in some publications at the time like Jim Burns' Arthropods and the issue of Design Quarterly assembled by John Margolies. Did you interact with any of the groups they mentioned? We had some contact but it was superficial and pretty much amounted to mail art. 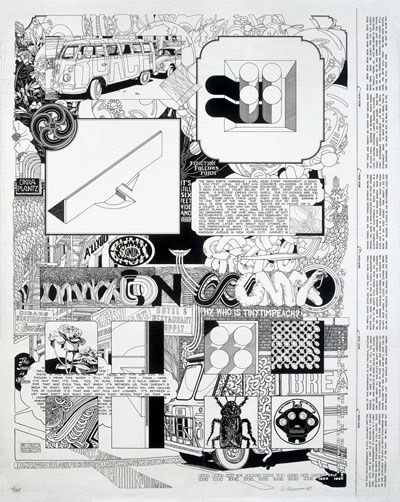 We were in touch with Ant Farm and contributed to the Whole Earth Catalog; we collected a file full of ephemera that we received in response to broadsheets. We met some members of a group that we'd been lumped with, Haus Rucker from Vienna. They had set up a studio in SOHO with the intention of making their mark in New York. We met a few times but the subject of their work or our work never came up for discussion even though we knew of each other's interests. Any discussions we had were about getting along in the city and little beyond that. They seemed to consider conversation dealing with our common interests taboo. Whereas we tended to be open and naive they seemed jealous of their ideas and fearful of being compromised. For us, we had so many ideas we had to beat them back down while they saw theirs as precious and to be guarded. I guess they were leery of someone else beating them to publication of what they saw as their inspiration. They were preoccupied with making their mark and then returning to the comfort of home (Vienna) to begin building their careers. How many "members" did ONYX have? Who were they and what were they doing? It's hard to say. There were probably less than twenty people we interacted with regularly. There was so much said and things were so dynamic that thinking back on it the core was probably four or five but others came into the chat at critical times and had something vital to offer. For instance, a discussion of types of drawings with the late Bob Buxbaum (BUX) arose out of our using a loft space in his building in SOHO to produce some of those paintings. BUX became obsessed with the paper itself, working with sheets of blue lined graph paper taped together into larger sheets in varying ways with different types and colors of tape. He was building his home in his loft at the time and made the walls of the bathroom with small square white tiles separated by grout of the same blue as his beloved graph paper. 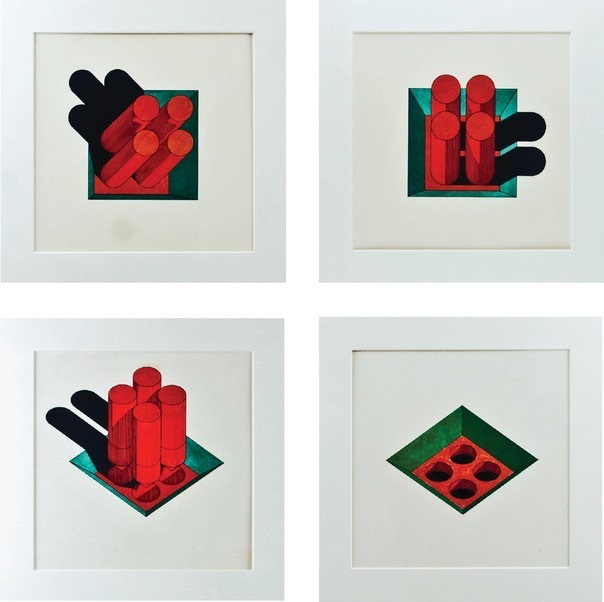 He had a show of drawings at Wittenborn that he considered "ONYX" work. We expected to encounter him wearing a suit made of blue lined graph paper assembled with strips of tape. Maybe with large black letters across the back that said "BUX". Chris Britz, who introduced us to the Haus Rucker group, was painting with spray guns on arranged canvas (actually bed sheets) that were pulled or pushed in various ways so that when he painted them from one direction with dark tones, he effectively painted in the shadows. When the canvasses were flattened out the shadows remained and the illusion of three dimensions was extreme. Chris made pocket money translating scientific and philosophic papers from German to English and the ideas he had to work with on those papers often spurred conversations. Some of the paintings I did were like pixelated versions of what Chris was doing, before pixelated images were rife in computer graphics. In 1967 we drove across the continent with the designer Leonardo Sideri and an architect, David Arnold. We took in Expo 67 in Montreal and went on to the West Coast with stops at places like Eero Saarinen's John Deere building in Moline. That was four of us for a couple of weeks in a minimal space. The conversations? Don't remember; probably mostly about food. The convergence of SOHO and work came together when Jaap decided to leave Wittenborn and open his own store. He hired me to design and build his store on the corner of Spring Street and West Broadway. Todd Watts, the photographer, joined us to build the place. "Us" was Jaap, a friend of his from Holland and Todd and myself. As I mentioned earlier, the development going on in SOHO provided work. There's a dark side to the story of Jaap's leaving Witteborn but that's tale to be told elsewhere. Todd was into the Zone system in photography and with Thorney Lieberman was doing exquisitely crafted black and white photos. They went on a tear to learn how to use the Zone system in color. We thought of them as not sleeping for a year. Thorney's book, New York Light is a testament to their success. I was asked to do some emergency photography by the I.M. Pei office; they liked my pictures so much they asked for more but I was too busy with my own projects. I introduced Thorney to them; he took the opportunity and ran with it. During the first months that his store was open, I helped Jaap out by managing the store so he could go to the book fairs and get a breather. Malcolm Morley was a regular in the store and liking what he saw he hired me to help design a loft he was remodeling for his studio and home nearby. Malcolm's work, based on translating images from one surface, size and medium to another by the use of grids was fascinating. It wasn't just enlargement and copying - he really extended the technique in many ways like with images on crumpled surfaces. I’d seen shows of his earlier at Jill Kornblee's gallery. Mike Hinge and I met at Donald Deskey Associates. We worked together on the design of exhibits for USIS, the U.S. Information Services. 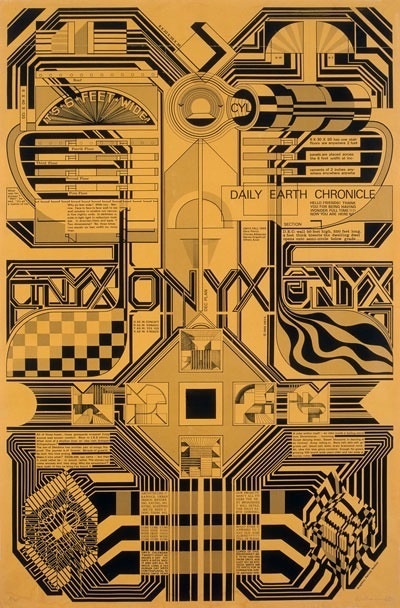 Mike was a science fiction nerd, an illustrator and designed covers for S.F. books and magazines. That sort of work, his love, was not rewarding financially and so he had to have a "regular" job. He worked for so many advertising and design firms that he seemed always to be on the verge of running out of potential employers. He was averse to conflict; if a job looked like it was going to be the least bit troubling, he'd pack up his tools and leave. Mike became a regular participant in our conversations and took off on many of our ONYX ideas. Mike died some years ago but Ivan Richards in England has done a thorough job of remembering him and his work on the web. Our major project for Deskey was an exhibit in Rome for water purification systems. We stretched hundreds of yards of green two way stretch nylon girdle material between the floor and a web at the ceiling. That created an under water “atmosphere" for American water technology. We heard that the two way stretch was sold after the show to Italian underwear manufacturers. 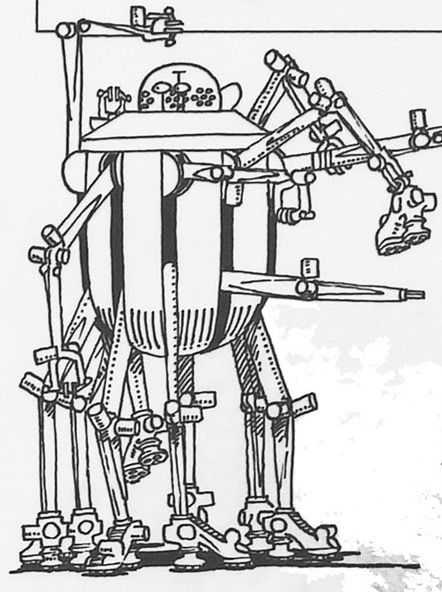 Mike’s fascination with the possibility of robots inspired Hiram NOK. Today it’s hard not to notice how technology will come up with a good idea and then improve it to death. Back then we had an acronym, KISS, that has been lost to the computer chip. What was the effect of your ONYX efforts for you and your friends? The spreading of our ONYX broadsheets and drawings opened doorways to work in the city's architectural world. Woody and I each entered and won the Birch Burdette Long prize for drawing at the Architectural League of New York. We were among the last to be awarded that prize; our drawings were quite controversial and drew a lot of criticism. But after that we were approached by architects who liked our work and who hired us to make presentation drawings of their projects. 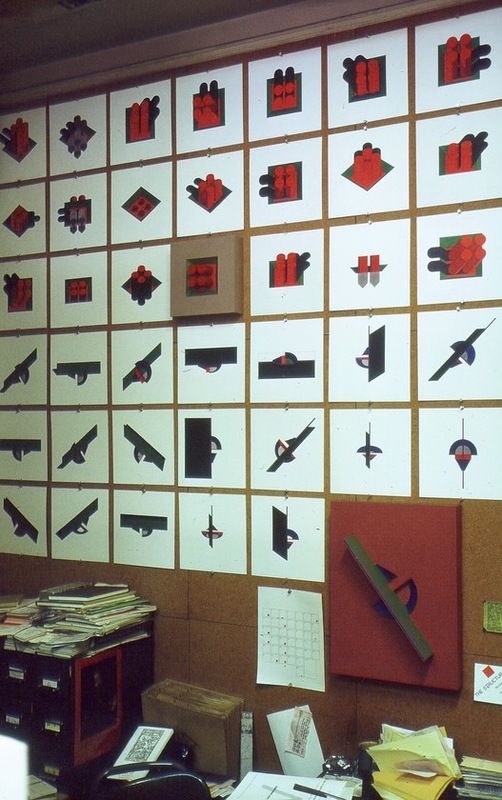 One series of drawings for Jim Polshek was of work that was being designed or under construction. Jim was the new dean of Columbia's architectural school and invited both Woody and myself to teach drawing in the architecture programs. Woody had married and moved back to Salt Lake City but after a year or so returned to New York. ONYX became kind of fuzzy, we drifted apart and it was some time before we realized we were both teaching drawing at Columbia. Elsa and I decided it was time to start a family and until the birth of our daughter she worked at I.M. Pei's office while I began to get commissions for small design projects. Mike Hinge was hard to keep track of and I guess the others felt less need for our conversations. Bux became preoccupied with food and began writing about it. Tommy Simpson, probably the most steadily productive in a particular genre moved around a lot and it was easy to lose track of him. Did you bring any of your ONYX ideas to Columbia? Not really. It was time to give ONYX a rest. The attitudes it developed were certainly there. It led to thinking about and teaching drawing in a fresh way. And the Columbia campus in the form of the Low Library inspired a project for me that would keep me busy for some five or six years, another story. Without a doubt I learned more about drawing at Columbia than any of my students - I was "in class" for seven years whereas they only had to put up with it for a semester. Most other drawing classes were of a traditional architectural nature using the techniques and tools common in architectural drafting at the time. Mine were "free hand drawing" classes but there were no restrictions as to how or what the classes might encompass. There were ONYX influences on how the class was taught; I felt driven to go back to the core of what drawing was all about, by encouraging tracing and copying and using photography to support a drawing. That met a lot of criticism from traditionalists. That criticism was quite easy to dispose of by pointing out that these techniques had their origins in learning drawing during the Renaissance. As far as using photography was concerned a reminder that the Renaissance painters probably used the camera obscura to lay out the cartoons for their works was effective enough. Those classes were actually more about seeing than anything else. Were you active in other areas? Design? What sort of design were you doing? Our interests were definitely not limited to architecture, drawing and painting. We looked at cars, mapping, motorcycles and anything that sparked our interest. Furniture design was of particular interest. 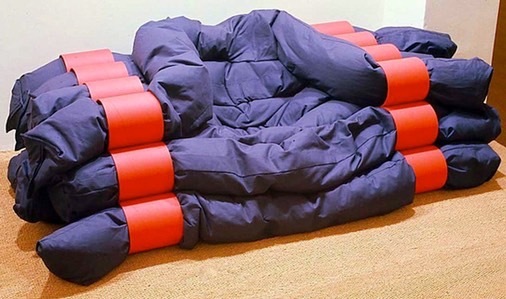 One project came to be known as the "Tube Chair”. 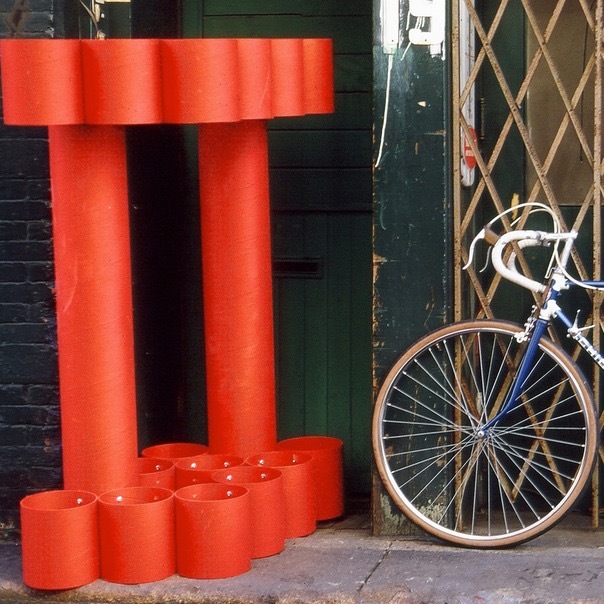 Sonotubes, cardboard tubes used as forms for concrete columns, provided its structure. Long sausages made of cotton sailcloth cylinders filled with a mixture of hard and soft foam and shipping peanuts were threaded through the tubes in a way that produced a gigantic chair, nearly 10 feet wide. Made mostly of colorful, very sturdy cardboard and canvas surrounding a malleable seat it graced its occupant with the sense of a throne. It was super comfortable and found a home for while in Peter Berman's gallery/office on East 19th Street. It made the rounds of spaces large enough to accommodate it and ended its known public life in Leo Castelli's Gallery on West Broadway. A nifty feature of the thing was that the structure could be upended and the canvas sausages threaded through it to make an easily changeable sculpture. We were all designing stuff. It’s fun to marvel when looking back through old notebooks and files of drawings to recall how much we did. Some of it might be questionable but it was all makeable and it did manage to be exploratory as far as form and techniques were concerned. At one point, thinking about manufacturing and selling some furniture led to working with Bill Post, an artist/craftsman who made our prototypes. We collaborated on a show at the May Furniture Fair at Javits Center and were well received. Difficulties arose when Bill fell in love, got married and died - only in his forties, his heart wasn’t up to the stress he put on it. What did you come up with working with Bill Post? How did that all start? Living part time in Montauk, using the basement of our house there as a workshop, I made some chairs. Bill made his way as a cabinet maker and made pieces for a number of my projects. He'd come out to Montauk now and then and the work on the chairs started a conversation about making furniture. There were a couple of the cabinet maker's benches around and the story of them and the Blades shop inspired ideas and designs. We realized that this utilitarian bench, when made in fine woods, was an elegant piece of furniture and knowing that Blades' customers agreed gave us confidence that we had a product we could sell. The benches are based on the cabinet maker's benches used during the installation of the shop's wood work. Watching them being used was the inspiration for the design. They are the perfect height for sitting down and getting up frequently, for putting a foot up for tying a shoe and for climbing up on to access to high storage. We had some made in woods that matched the mahogany and oak in the shop. The seating in the shop was the benches and one nice comfortable chair for the "wife". Blades ended up selling as many benches to customers as they sold suits. The chairs made at Montauk were made of #2 pine. Not having much money limited the choice of materials. There’s a tradition of "roadside furniture" made to be sold along side a highway, mostly made of lumber from the local yard. Wondering what could be done design wise with that sort of common material, I just drew up and built stuff. Only sketches of some of the work are left now, but a few pieces are still around and in use. We eventually came up with a complete line of furniture. There were chairs, a floor lamp, a folding screen, a mirror, stools and benches. The designs for an easy chair and sofa were finished and waiting; the sofa's prototype was made for a client later as well as a dining table. The second prototype of the table is still being worked on; it's had some use time to prove it. 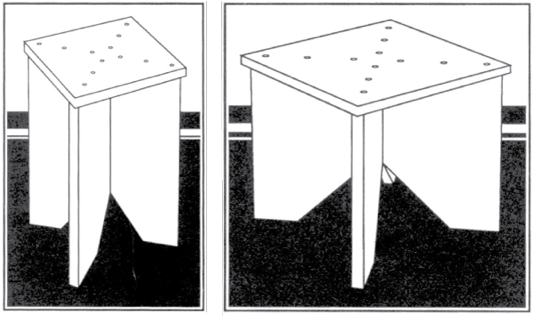 The bookstore stool was originally designed for Jaap Reitman's book store. It requires a very careful assembly by a wood worker well versed in the behavior of wood as it expands and contracts. Put it together in the wrong way and it will destroy itself. 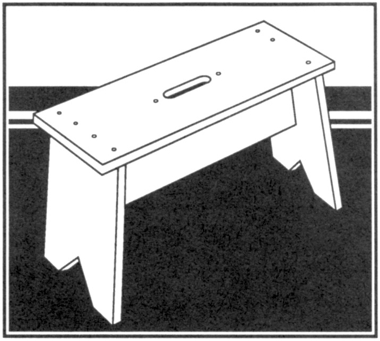 The stool was made in different sizes and grew to barstool height for use at a high work table. The Vail stool was designed to serve as a side table, and combined with another, as an emergency coffee table or as a seat when the guest list outgrew the furniture. The floor lamp was made of a cylinder of photographer's background paper, "sweep" or "Seamless" wrapped around a length of "Sonotube", the concrete form tubing we used for the "Tube Chair". It had a ceiling washing flood lamp mounted just below its top. The paper outer covering could be changed to other colors in the sweep range to coordinate with decor changes. Not really realizing then the benefits of standing while working, a design came out of our drafting experience: a high surfaced work desk. A complimentary piece, a cabinet that could support one of the large TVs of the day was part of that idea. It had adjustable shelves and slots for accessory wiring behind its doors and casters hidden within its base so it could be moved about easily. 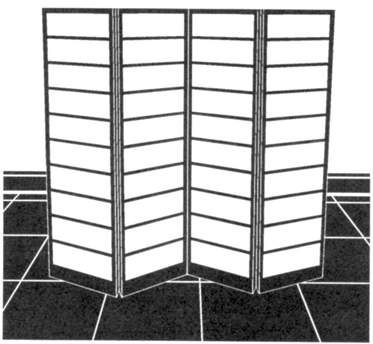 The "Foden Shoji" screen was made of a wood frame covered with a material model builders know as "Polyspan", a material used for stiffening in the lining of garments. It's shrinkable with heat, tough, and printable. The black lines, printed on the skin recall the pattern of a shoji screen. What was the result of all that effort? A catalog, a newsletter; we took part in the Spring furniture show at Javits Center. Bill's personal problems began to overshadow the project. He was an important element in the work with his knowledge of wood and how it behaved. It would have taken forever without him and a many more prototypes and failures. The pieces look really simple but the sophistication of their construction is hidden from the casual eye. If these pieces were made without the techniques Bill came up with, they would crack, split and occasionally blow themselves apart. Our initial prototypes were assembled innocently and we learned quickly that there were forces in the behavior of wood that had to be accommodated. The final prototypes still exist, solid and useful; they're a testament to the care we put into them. But, to answer your question, I was drawn aside by other work, commissions that paid the rent. With the loss of Bill, I set aside work on the line except when a job needed a piece and something from the portfolio could be used. Are you still working on furniture? Yes. The current project is for an oval coffee table. What started out to seem a simple table has gotten quite complex. Since woodwork is a less consuming occupation of ours now, we have to work slower and solve each conundrum as it comes up. Working with a fellow model builder, Jim Reid for some years, has developed a discussion similar to what we had with Bill in the past. We've taken to making fixtures that make fabrication easier, like the trammel of Archimedes, to draw and cut ellipses. The project with four cylinders in a sort of pit or depression; what was that about? That was the Head Start Monument or HSM. It was four very heavy concrete cylinders set on a site that could not support them. The idea was that they would slowly sink out of site/sight. The depression, the pit, gave them a head start on their journey. The monument was dedicated to Richard Nixon. I have to thank Matthew Raue of Sundowner Vintage Art, online art dealers, who found us on this site and sent me photos of four of the HSM images from the Wittenborn show. I had no idea where they'd gone since Wittenborn's was so disorganized at the time. What has become of ONYX since? How has it affected your work and thinking? It's been alive and well but not publicly. We've decided to look at what we've done and organize this document about it. So far, we've hardly scratched the surface. ONYX had a rather reluctant public side; it was largely a conversation about things that interested a few people who were often too busy to go more public. Some of our architectural work was for public or semipublic spaces and that was often enough. We were happy with our own versions of exhibiting and satisfied ourselves with making virtual public appearances. I don't get it. What are virtual public appearances? Did you document them? It started when we were making the rounds of the city's galleries and talked about having shows in any number of them. My visits were mostly during off hours in the middle of the week. I was in a gallery and wondered about the size of it and paced it off. I made notes and did a sketch of the space's plan. When I spoke about it someone suggested documenting a few gallery layouts. With a notebook and a tape measure I’d pace off the spaces and measure ceiling heights. After collecting 30 or 40 plans I assembled 25 of them into a small booklet that Jaap sold. 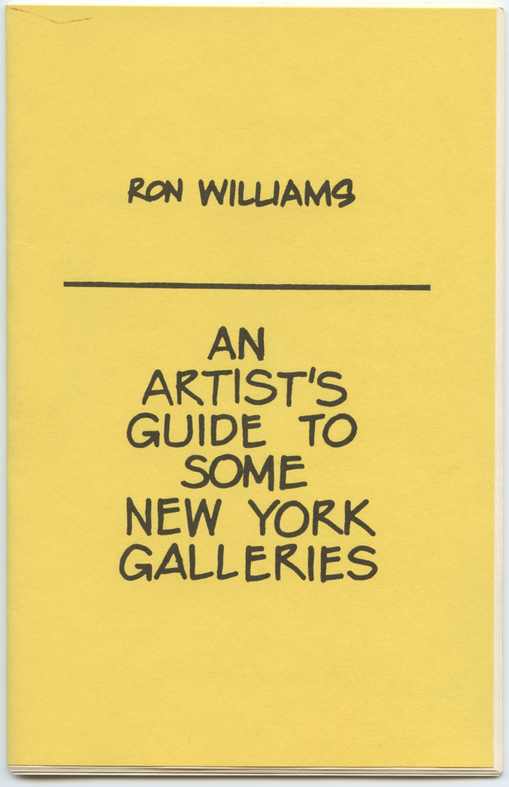 Synopsis: In this pamphlet, floorplans of twenty-five New York City galleries were hand drawn by the artist (including measurements estimated by his pace of about 31")and sent out through the mail. This copy has cancelled postage. What did the gallerists think of that? Did any of them see it? I don't know, except for what happened at Wittenborn's with Leo Castelli. I’d left a copy with Leo since his was the first gallery I measured. He asked me how I did it and I told him - he was amused. He didn't know how to get a hold of me and wanted more copies so he went into Wittenborns and asked Jaap for some. Jaap had sold what he had (the edition was small, 100 copies) and called me for more. He thought it was great that Leo wanted the little book. I found a few copies recently. Was there any such thing as virtual public appearances then? I was my own audience and of course anyone who came upon the appearances. 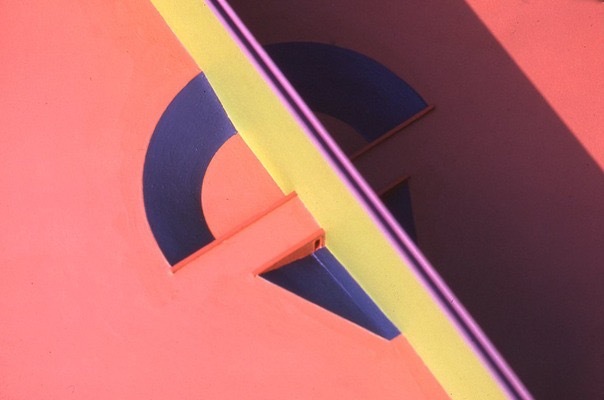 I was interested at the time with imposing basic geometric shapes, like the square, circle, triangle, line, and dot on various objects and with their three dimensional counterparts, the cube, cylinder, pyramid and sphere on various spaces. I did a series of drawings of shows in a bunch of galleries based on the plans I had collected. The real thing would have been a pain to do but the drawings totally satisfied the urge for a "big show". Nowadays, one would simply hire a studio manager, a staff and do it for the real. Later on I designed a gallery for Aaron Berman on West 57th Street. I built a small model of the gallery out of white cardboard and to make it look more real, put up a show in the model of paintings that came out of the change in our life when our son was born. The model was received as charming and I still have it. The gallery itself is long gone but my little show still gives me a kick now and then. A new more public audience seems to be showing up. It could be said that ONYX has always been there but it has been kind of personal and a resource for those of us who took part. Except for the times when we poked our heads out of our cave we've not had much to say about it until now. 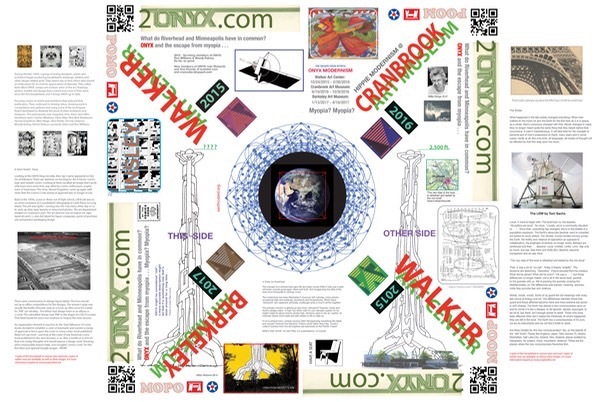 Our work showed up recently in the archives of the FRAC Center in France and the blog dedicated to the memory of Mike Hinge. There was some confusion about who or what ONYX was so we decided it was time to straighten out what it was all about. Now we’ve been working on getting material to the Walker Art Center in Minneapolis for a show in the Fall of 2015. What about other art galleries? Didn’t you design a few over the years? Yes. When we lived in the East eighties I walked to work nearly every day. I passed Brooke Alexander's gallery a few times a week and it became the easiest gallery to stop at on my travels. The gallery was very small and cozy and we'd chat about things that I'd seen in other galleries. I realize now that a lot of gallery people seldom get out to other's shows and become sort of isolated. Brooke asked me to help them design a new gallery over near Madison Avenue and that was the beginning of a period of gallery design. There was a second gallery for Brooke on West 57th Street; he shared a floor with Jill Kornblee who knew me as a gallery goer. She had me design her part of the floor. Brooke moved downstairs to a gallery that used a whole floor which I also designed. There's a funny story on that project. Daniel Wolf saw that work and hired me to do his photography gallery up the street. I did some spaces for Robert Miller and John Cheim and Kelly Anderson and maybe there's something I've forgotten, but one thing led to another . . .
What about the paintings? Did you show any of them? What were you painting? There were three main themes. The first was concerned with images of the ONYX projects like the DEC and MBH and another called CHINA about which not much has been said. The second subject was an exploration of sets of systems that were presented on canvas to try to determine how much of them could be seen. The third subject was an exploration of the elements of rendering three dimensional space on the two dimensions of the canvas, depicting shade and shadow. Maybe we should take them one at a time. You've spoken about the DEC and MBH and I'm curious about CHINA but let's clear up this "sets of systems" subject. It started with seeing some paintings by Larry Poons at the Castelli Gallery. They were the paintings with ellipses floating in a field of color. Some were arranged on lines that were at an angle to the canvasses edges and they intrigued me for two reasons. First, I love ellipses. Second, the patterns they lay in had a mystery about them because I found myself thinking of the paintings as cut-outs of a larger field. Driving through the fruit and walnut ranches of California above Sacramento opened the way grids could be seen more richly if secondary aspects of them were exposed. 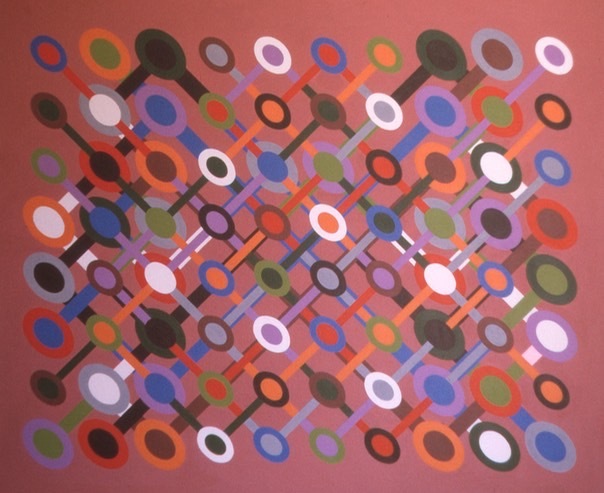 I'd also been looking at patterns of grids that had multiple levels describing something like urban networks and began to assemble grids of double ellipses connected by "pathways" on a grid set at forty-five degrees to the edge of the canvas. Then I started coloring the ellipses systematically with two other grids that were at different angles than the major grid. I think it might be almost impossible to describe them in words. Of course it could be done but it would sound like a math PHD's dissertation on something that's relatively simple. The forty-five degree grid is apparent. Call it a basic Grid. Other grids, the Color Grids, can be seen as the diagonal of two or three squares on which only the colors are related such as the grid that holds the white ellipses in the painting above. Whew. Were the paintings that dealt with shade and shadow any easier to look at? I thought so when I began painting them. They seemed easy to see at first and almost too obvious. 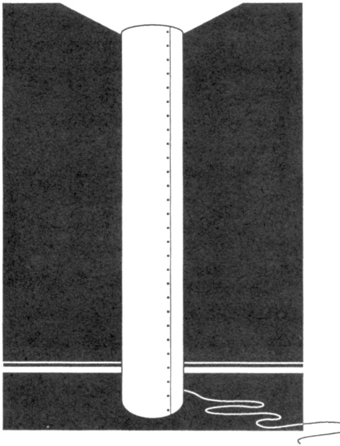 But they were based on a simple diagram of what a shadow cast by a cube would look like on a flat surface. It turned out I'd made too wide an assumption about people's ability to see an image of three dimensional space. I'm not sure I get what you're saying. The systematic drawings or paintings certainly require effort to see what you've done; there's more there than what first meets the eye. How about these 3D drawings? They look rather simple. They are rather simple but I was surprised when I realized that many people didn't see the 3D aspect right away and were surprised themselves to experience it. For some time the paintings and prints were frustratingly ineffective. I was loathe to explain what I was trying to do; it felt like having to explain a joke. Much of the process was for lack of a better way of describing it, organic. It was a result of trying to get a grasp on inchoate ideas and impulses. I thought the illusions I created were or would be obvious to anyone but they were obvious only to me and those who had a more highly developed practice of seeing. In fact they were often too obvious to those more practiced at "seeing" and could be considered visual clichés. Well, I guess I have some experience with seeing since I see what you're doing pretty easily in the images you're talking about. Am I missing something? Probably not. But the surprise for me was when I heard about how the images affected some highly sophisticated viewers, a bunch of architects. The prints were hung in Peter Berman's office along a passage that discouraged their being seen from any distance. The people who used the office passed the images many, many times a day and they became used to their presence as nothing more than decoration. Then, as one of the inhabitants was passing the prints, he was startled as one of the images seemed to pop out of the wall so that it caused him to react physically. It seemed for a fleeting moment to be fully three dimensional but when they looked again the image was as flat as ever. This "popping" of the images began to occur more often and the architects began to look more carefully at the prints trying to apprehend the illusion they presented. I came to realize that the effect I was trying to create required practice to see them. What I saw was often not apparent to the casual viewer. When a viewer other than myself finally saw the illusion however, it was usually much more dynamic experience than what I had expected. I discovered that there were shortcuts to the dynamics of the illusion. Squinting, moving away from the image, using a "reducing glass" or taking off one's glasses could make an image "pop". How did you get into these forms? What did you see that got you going it this direction? My interest in drawing and painting has been in the presentation of the illusion of space on a two dimensional surface. This arose out of the need to represent the sensation of space in rendering an architectural idea. As I drew and rendered architectural space I became intrigued with how the elements that enhance the illusion of architectural space such as shade and shadow were worthy of being isolated and explored by themselves. 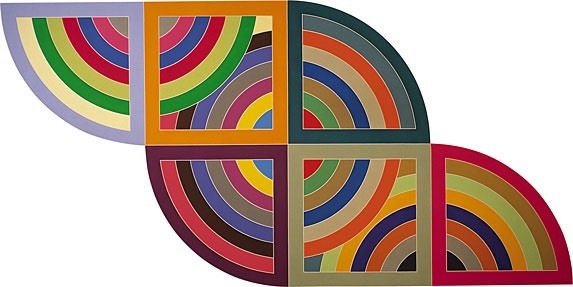 I always liked Frank Stella's paintings but I became particularly interested in them when I realized that his efforts where in opposition to my efforts, i.e., Haran II, 1967. Where Stella worked to reinforce the two dimensionality of the painting's surface, I was consumed by the desire to visually violate that surface. My push-pull was more mechanical, in support of illusion. I saw Stella's push-pull as a means to deny and frustrate any illusions and to declare the flatness of his painting's surface. During that time I began using forms suggested by Stella's paintings but that arose out of my fascination with architectural space. That's when I began to draw and paint images of ziggurats, the stepped pyramids, using the basic elements of three dimensional illusion, shade and shadow. You didn't do a lot to put your paintings and prints out there. They certainly didn't enjoy the push that the ONYX images did. Why was that? Some of the reticence came from trying to do something that I thought at the time was not cool. Over the years I realized that I was so intrigued with what was happening visually that it didn't matter whether my work fit with what other people were doing or not. Op art left some doors ajar but like photorealism it seemed shallow to me, being pursued out of a desire to entertain, surprise or fascinate a viewer; it never held anything back. It was so overt that the experience of it was over quickly. Quite often such work is more fascinating in the execution of it as the artist sees it happening but that excitement doesn't often transfer to the experience of it as an object, on a wall, in a gallery. What interested me seemed to hold my work away from the viewer and relied more on the viewer having to expend some effort to get the message. It was a phenomena I didn't realize existed in my paintings and prints at the time. I guess it could be called “Slow Op Art”. 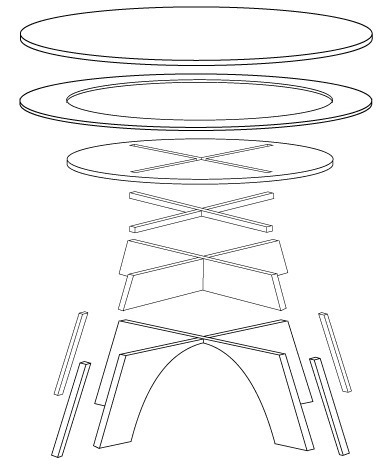 The ziggurat images and some of the DEC images are void of any indication of perspective. What were you trying to do? Stripping an image of rendered three dimensional space so that only the elemental shade, shadow and color were depicted required the removal of perspective from the work. This meant that the lines depicting a rectilinear form needed to be perpendicular or parallel to each other and had to be shown parallel to the edges of the paper or canvas on which it appeared. During a visit to the Jacques Marchais Museum of Tibetan Art on Staten Island I saw art that was sympathetic to this system and I began thinking about the depiction of space in eastern art. The Eastern art I found interesting uses an organizational hierarchy to depict space by assigning subject matter that is further away to the upper areas of the composition and closer subject matter to the lower areas. What's further away is up top and what's closer is down at the bottom. Objects depicted are shown as they are rather than as they might appear in perspective. 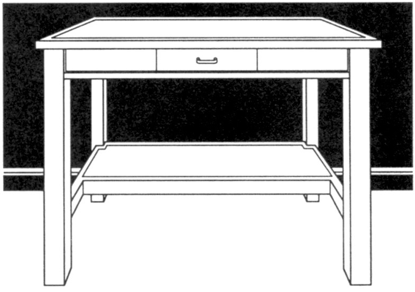 Another component of this arrangement of space but not used that often, is to make objects that are further away smaller than objects that are closer. Though I didn't explore the possibilities in depth I began doing simple drawings of interior spaces that used the Eastern hierarchy to organize the depicted space. I liked the idea of representing things as they "are" rather than as they "appear". I did a lot of renderings in what's called axonometric view at the time. This informed a series of prints based on the paintings of ziggurats, in different color combinations and on different colors of paper. I gave some of the prints to friends, exchanged some for monetary support from acquaintances who liked the images and a few were dealt on the art market. You've said that there are other elements of an image's composition that can contribute to the illusion of three dimensions. How does that work? Over time, I did realize that there were other factors beside basic shade and shadow that could contribute to the illusion of three dimensions. We're used to seeing an image with rectilinear borders enclosed in a rectilinear area. If an image's borders are laid out so that the image is itself seen in perspective this can contribute to another order of the illusion; the fact that the image’s edges are not parallel to it's surface's borders contributes to the illusion. Most of the sketches I do for architectural work are drawn on blue lined graph paper. Every once in a while a drawing will "pop" from its page with an illusion of being in a space that was free of or into the paper's surface. This reminded me of an accident that added another element to the creation of the three dimensional illusion. I was making a drawing using old time mechanical instruments to draft an illustration with thinned paint. The process was messy and required repeated attempts to get a "good line" by pulling a loaded drafting pen across a piece of paper as a practice/test stroke. The scrap paper I was using fell to the floor and exposed one of my ziggurat prints. I couldn't resist and drew the colored test line across the print. Magic happened as the ziggurat's image retreated, the new line came forward and new space appeared in and on the print. I continued to overlay grids of color on prints. The grids were either parallel or at an angle to the print's paper's edges. This reinforced the illusion of a secondary image or surface through which the primary image, that of the ziggurat, was seen. Using different colors and weights of line for variously placed grids made the illusionary space even more complex and dynamic. What happened to all of this work? Who has it? What became of it? Well, much of it was traded with others, given away, some sold and some just disappeared. I traded paintings for space in which to make them, for dental work, other's paintings, photography, whatever I needed or took a fancy to. They just managed to find homes for themselves. Even though I worked in the art world designing for gallery owners and dealers, I never tried very hard to push my stuff. I had a "studio visit" with one gallerist who was so smashed I wondered whether he would pass out; that alarmed me and kind of cooled my ardor for promotion when I heard it was not an uncommon experience. I'd like to go back to the DEC and the MBH. Were any of those projects built? No. Over the years I've thought about it. I might have had real enthusiasm to build the Daily Earth Chronicle but then I always found myself setting up criteria and circumstances that would make it extremely difficult, like siting it very remotely and making it difficult to reach or making its structure short lived, temporary. I've thought of building a full scale model of the Daily Earth Chronicle in the New Museum on the Bowery at full scale. It would project out over the street and the back of the museum building. The permits would be a nightmare and maybe even fun, too. But doing it is not the point; it’s an exercise in imagination and fantasy. Have you ever experienced Smithson's Spiral Jetty? It's a bit disappointing, but it's impossible to leave behind not because of the jetty itself, but because of the drawings he made of it and the photographs made of it from the air. You hardly ever see photos of it from the standpoint of someone there, walking or climbing on it. They exist but they're like, "What?" There are aerial photos of it with the water being blown over it by the wind that are marvelously lyrical and they’re far more effective than the immediate experience of the art itself. In reality it's dull, but it's still exciting as a concept. I suppose that if you're flying over it it could be exciting but being there it falls short of having seen it as an idea or translated via photography. Ideas like earth works are most successful as brain scratchers. When they're realized they tend to be disappointing. I think Christo knew that. It might be why he never tried to make his projects permanent; temporary was fine. I realized that depicting the ideas was satisfying enough and in fact, not all that easy to do. Nothing's permanent in the Universe and it's difficult to accept that. Maybe that's the meaning of life, what has to be accepted to make the most out of life. Earthworks like the pyramids, like Beni in Bolivia or other ancient ruins required a whole different culture to create and yet we've done even more with the cities we've created that dwarf those ancient structures. But they're not permanent either. An asteroid/meteor can change the face of the Earth in seconds. The MBH? Well a form of it actually got built in a way but even I didn't know I was doing it. When we bought our old house in Riverhead it was too small to work and live in so we built a workshop/barn. We began with a simple empty space that looks very conventional but is quite high tech/low tech (but disguised). It's super energy efficient, but that's another subject. When it came to filling in the empty space I wanted as much floor area as possible but not at the expense of losing the entire, full height space. So instead of a full second floor I put a balcony around the perimeter that would allow a full height central space. This expands the sense of the interior space and provides a vantage point for photography that lower, full ceilings would never allow. The balconies vary from five feet wide or so to more that six feet. There's lots of ways to experience a minimal space to live in and circulate on on those balconies. I realized years after the barn was built and in use how it followed the ideas that were part of the MBH. These balconies that I use for work and storage can easily be used to explore the possibilities of minimal living spaces with full scale modeling. But, what it might be like to live in a minimal space without all of the comfort we've become accustomed to became the question that prompted the studies. How could narrow spaces be organized to accommodate our modern life style? How could a sense of claustrophobia be softened or dispensed with? Living in a minimal space in an urban environment would require relief. Spaces like theaters, museums, clubs, libraries, restaurants, atria and other public or semi public spaces can provide relief but at some point there's a need for a more private large space. In a way, Starbucks has become the living room for a lot of city people and solves just this sort of problem. The MBH is a study of large and small being combined so that there's less of a progressive hierarchy of spaces and more of an extreme, either or type of relationship. When we were kids we'd dig holes and build forts and caves and huts and some adult would come along and tell us that if we dug deep enough we'd come out in China. That came up in a conversation that expanded on what seemed like a great weight hanging in mid air, waiting to fall and that was the looming potential in the 70s that was China. We started doing sketches and I came up with a groove in the earth with the word "China" at it's bottom but that could not be read because the groove was between two walls that interfered with a clear image of the word at its bottom. It was meant to be illuminated but readable only by flying over it and then only for a fleeting second. It wasn't thought out in any depth but it was predictive. I did sketches of variations on that project that are hanging around. So you mentioned a diversion inspired by your encounter with the Low Library at Columbia. What was that about? I have to go back to my teenage years. I spent most of my time as a youth flying model airplanes. I flew free flight models at meets in competition and for fun with my brother and a schoolmate, Larry Davidson. We all won lots of trophies and at one point I won a trip to an international meet in Detroit and won a few prizes there. We designed our own planes and of course, built them. The skills I acquired messing around in that hobby served me well in architecture school when it came to understanding design and model building: I had a great grounding in hand skills and had started to develop an eye for design that put me at an advantage in school. The celebration of the U.S. 200th Centennial in 1976, while I was teaching at Columbia, inspired lots of centennial events and the AMA, the Academy of Model Aeronautics, held an international model meet at Lakehurst Naval Air Station in New Jersey that summer. I took a ride down to the meet with my daughter Megan and Mike Hinge to see what was going on. We wandered around looking at all the events. The day was really hot and humid and flying events were being delayed due to a large thunder storm coming into the area. We decided to look for a place for shelter and I remembered that there was a event for indoor free flight flying in one of the old dirigible hangars. We made our way there to watch. What do you mean by "free flight”? The planes we flew up until the fifties were mostly flown without controls, they were preset to fly in a repeatable pattern. But most models today are flown using radio control. Free flight is still flown and has a large following but the popular conception of model flying today is that of "RC" or radio control. The types of models flown at that meet were controlled by the modeler different ways. 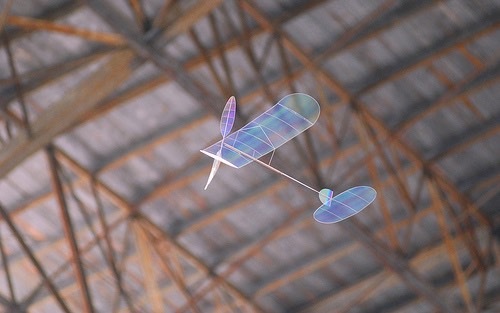 The free flight model was adjusted to fly in its pattern and then released to fly on its own, or "free flight”. Back to the storm. Sorry. The storm approached with all the appropriate wind, thunder and lightning and the flyers inside the building hurriedly brought their planes down with helium filled balloons on strings; they put the planes away to await the storm's passing. One of the flyers told us we were about to see a freak of nature and encouraged us to stay and watch. A thin cloud formed along length of the top of the building when the storm hit and the cold rain quickly cooled the building. As the cloud of humid air condensed it began to rain inside the building. This was the reason everyone rushed to put their models under protective cover. The combination of architecture of such a colossal nature and the model airplanes flying for nearly a half hour on a rubber band motor was irresistible. Hangar five, the site of the meet, was 157 feet high inside and over 300 hundred yards long. I began building indoor models and learning the art of flying them, taking part in flying sessions wherever I could find them and looking for spaces in which to fly. As I became more expert, I returned to fly in the hangars at Lakehurst many times. About that time I read John McPhee's The Deltoid Pumpkin Seed about the Aereon lifting body and that helped to awaken my enthusiasm for flight. I eventually met some of the characters in that book since they were indoor flyers themselves. One day at Columbia I ducked into Low Library to avoid a downpour and discovered McKim, Meade and White's Rotunda. With a bit of research I found out how to get to the powers that were and established flying sessions on weekends. 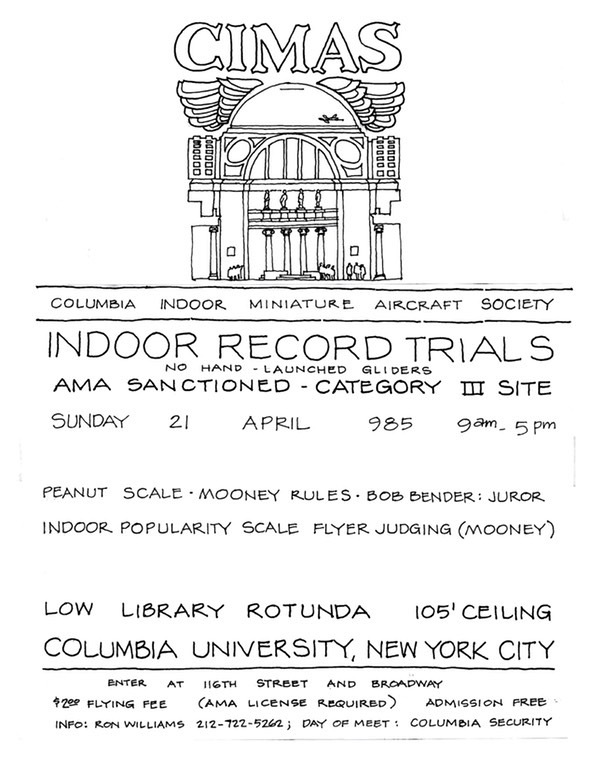 The Columbia Indoor Miniature Aircraft Society (CIMAS) was formed and we flew there for four or five years. During that period I kept a note book, illustrated with sketches and full of the arcane information and data required to succeed at indoor flying. Newcomers to the hobby would find their way to me for help and I would loan them my note book. There was constant encouragement to publish a book but I was already quite busy with teaching, architectural projects and rendering commissions. Word got around about our flying in the Rotunda and a reporter from the New York Times showed up. A week or so later we were featured in the "metropolitan" section of the paper and a week or so after that I received a letter from Simon & Schuster asking me if I would be interested in writing a book about what we were doing. It took some time to organize but for the next four years I worked on the book and it was first published in 1981. The whole experience was fun. I encountered a tough talking, pack-a-day agent, Patricia Falk Feeley, met Michael Korda, Simon & Schuster's editor in chief and the interesting people who got the book in print. The most important person I encountered was my editor, Jim Ramsey a young man who gave me an education in writing, editing and publishing. What's the story about your encounter with Michael Korda? Pat Feeley arranged a presentation of the book project to him. As the time for our appointment approached she began apprising me of what to expect; I'd planned to show Michael the microfilm F1D model. The F1D model had a wing span of a bit more than two feet and was maybe thirty inches long. By competition rules it could not weight less than a gram. If you think about the size of it and the fact that three of these planes would weigh less than a penny, you'll still have a hard time imagining what they're like. Michael had just published his book titled Power. One of the things Power advised an executive to do was to arrange his office so that visitors would not feel comfortable, like having strong light behind the executive's seat, making the executive seat higher than the visitors seats, etc. It was very thoroughly thought out. As we were bringing my models into Michael's office, Pat predicted that he would keep us waiting for about a half hour. I'd read some of Power and mentioned it to Pat who had also read it. We kind of grinned at each other and immediately began rearranging the furniture in Michael's office. We relocated his desk, the sofa, the interviewee's chairs and the coffee table and sat down to wait. After the half hour, almost to the minute, Michael started into the office, stopped and said, "Oh, I'm sorry", and started to back out. Pat yelled "Michael!" and told him he was in the right place. He came in and looked around and Pat reassured him that it was his office but that we had to rearrange things so we could properly show him what we'd brought with us. He moved behind his desk and plopped into his seat (Pat had lowered it an inch or so). Obviously disoriented, he was too polite and at this point, too curious to kick us out. We began our presentation, he got his bearings and I showed him my models. When at last I very slowly raised the F1D model from its box, he actually gasped as did Pat who had heard about it but not seen it before.